Your Airport transfer online taxi reservation! 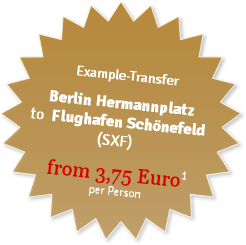 Your easy people carrier shuttle for the airport Berlin Schönefeld (SXF) and comfortable taxi transfer to the heart of Berlin! Did you book a flight (vacation or business trip) and now you need to arrange a taxi to the airport or from airport to hotel / home? Don't hesitate and feel free to contact us by our taxicall and we reserve an airport shuttle or a limousine for you. The best way is a preliminary / advance order using our online ordering form. So, enjoy a relaxed start to your Berlin holidays. Punctually your driver will be waiting for you at the agreed time and takes you directly to your city goal. We look forward to you again on your return. BER-LINE is an independent taxi company based in Berlin Schoenefeld – close to the international German airport / SXF / BBI / BER. On request we can also drive you to other locations, such as to Warnemunde (Warnemünde) ferry or Tropical Island. Through cooperation with partner companies, we can realize almost any transportation request. Order conveniently through our best right taxi-order. 1) Example-Transfer: Berlin Hermannplatz to SXF with 8 persons. We'll pick you up – on time, reliable, courteous, convenient, from house to house, with lots of luggage. For long stretches we make you an offer.